It took a little longer to get to and from work at the weekend. 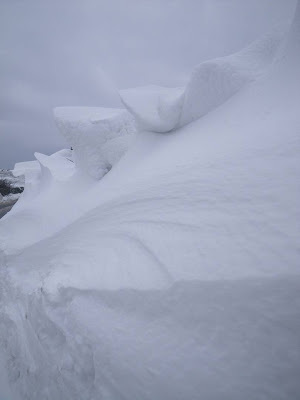 I crept along the road with one eye looking ahead, and the other on the amazing snow formations built up against the hedge. 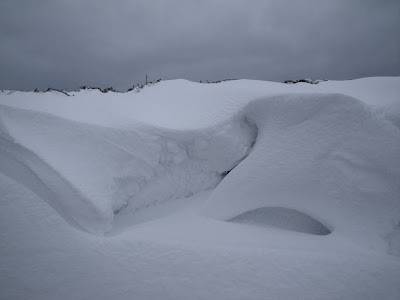 Crazy shapes created by the strong winds and light snow, can you see the face?! 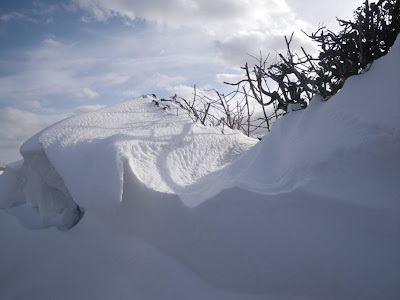 Blowing snow is the Meteorological term for any loose snow lifted from the ground surface and suspended by strong winds to a height of 2 m (6 ft.) or more above the surface. Drifting snow is only raised from the ground surface by the wind to a height of less than 2 m (6 ft.) creeping, rolling and bouncing above the surface. The snow which is being blown about may deposit as snowdrifts. 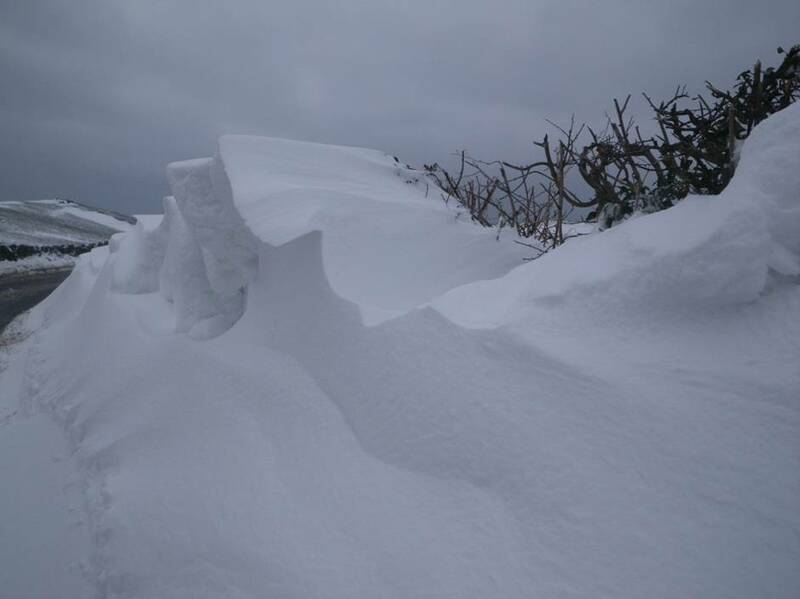 The two photographs below were taken at the same spot along the hedge. One on the way home in the evening and the other in the morning the next day when the sun was coming up. The view opened up as we drove from Grizedale visitors centre to Moor Top. The definition of the dune-like landscape was enhanced by the shadows cast from the rising sun. If you've been reading our Hilltop, the Gallery and Wray Castle blog, then you will have seen that Wray Castle is open once more for the 2013 season. There was a mad dash to the finish line to get everything ready, but with the help of some wonderful volunteers and many staff we did get there and were ready to open as promised, so come and say hello! They are open 10am-5pm everyday. This year something that is slightly different is that the Ranger team were given a room to call their own. Called the countryside room, it is a room where we decided to bring the outside, in. Afterall it's what we know best about! The question was where to begin? Do we put a sprinkler system in to recreate the great British summer, maybe some sheep poo to recreate the aroma? Or perhaps just some sheep?! Well where we did in fact start was by ordering some astro turf to lay as carpet, then we carried up some stone to build a dry stone wall and for good measure we carried up some massive tree discs to act as a history lesson! I think half of the house staff thought we were a bit mad, and well yes we are, but it was great fun! The drystone wall and mini walls for people to have a go at walling with. So lots has been done, but we are still adding some finishing touches, including getting the astro turf properly fitted and adding some fencing and a gate. It will change throughout the seasons and during the summer you may even find a ranger in the room running some activities. Eitherway we hope its a room that lets people engage and learn about what we do, so when you're next in the castle go and have an explore (just be careful of the sheep...)! Beatrix Potter is well known as a children’s author and illustrator but perhaps less well known is the fact that she was also a farmer ,land owner and for a number of years worked for the National Trust as a voluntary Land Agent . In this role in the 1930’s she helped to look after some of the National Trust property across the South Lakes , including farms , houses and woodlands much of which was either donated or sold to the Trust by Beatrix Potter herself. 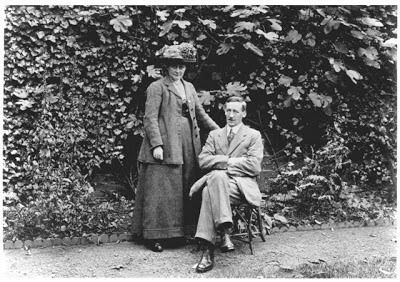 Even though she came from a wealthy family and was raised in a luxurious house in London with servants and a governess , she wasn’t frightened of getting her hands dirty and was very actively involved in the day to day decision making that was required to ensure that the Trust owned property was well looked after. Beatrix Potter the day before her marriage to William Heelis. I have recently had the opportunity to look through some of Beatrix Potters’( or more accurately Mrs Heelis as she was known after marrying in 1913) letters to Bruce Thompson The Trusts’ first Land Agent in the lakes. A few things leap out from the pages . It is quite striking how things have little changed over the years, the challenges and issues that the South Lakes Rangers face today are identical to those that Beatrix Heelis and Bruce Thompson faced in the 1920’s and 30’s . In one letter dated Jan 4 1937, written from her home , Castle Cottage in Near Sawrey, she writes at some length advising Mr Thompson on the best type of fencing to use on a wood boundary that floods regularly ‘ It is usual to put round wire near flood water, because woven wire netting gets clogged with drift ‘ . She then goes on to extol the virtues of ‘Hercules’ netting over the cheaper ‘Wrylock ‘ co-incidentally we still use Rylock netting for most of our fencing jobs these days . Ranger Team helping to fence a wood with Rylock netting in foreground ! The management of surface water is a constant challenge for our Ranger teams with torrential rain becoming common place damage to paths and fields is something that we deal with on a regular basis . The solution in many cases is to do exactly what Mrs Heelis mentioned in the letter namely to increase the size of the field drain , so that it can take a greater volume of water ; very costly and time consuming but the right decision in the long term. Yew Tree Farm in Coniston is a farm that Mrs Heelis had strong personal connections with and the challenges of finding a suitable new tenant are mentioned in one of the letters . She felt that the existing tenants had not made the most of the farm . ‘ Yew Tree as a farm has a bad name already ……..What it wants is a tenant who would concentrate on the visitor teas.’ Beatrix had helped to set up a tea room on the farm to help bring in extra income at a difficult time for farming. We as Rangers get involved with the selection of farm tenants from time to time as an organisation we , like Mrs Heelis , are always looking for people who will run a successful business , look after the land and who are comfortable with the high levels of access on Trust land, that we encourage. 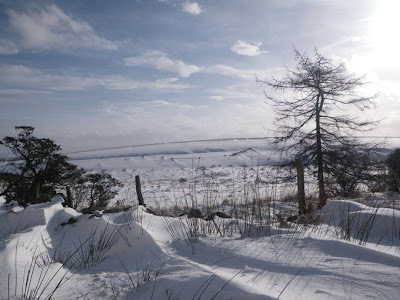 In other letters she talks of installing benches at Tarn Hows , vandalism by mischievous local boys, woods where timber for fence posts and rails may be sourced from and writes quite disapprovingly about a new fence that has been erected at Holme Fell . All very familiar issues and decisions that we get involved in today. Apart from the striking familiarity of the issues discussed , the letters also reveal something of the character of Beatrix Potter ( Mrs Heelis ). When asked about their relationship, Bruce Thompson wrote that he was quite scared of her , and didn’t look forward to their meetings . The letters show that she had strong opinions on things and was obviously very knowledgeable about farming and land management, I get the impression that she didn’t suffer fools gladly . I,m not sure how this fool would have enjoyed working with her ! ﻿﻿﻿But it wasn’t just painting: A plumber has fixed some leaky pipes and a seamstress has patched up some of our most worn out old sofas, broken tools have been mended, a new barbecue area started and our garden area given a tidy up. With all the many miscellaneous little jobs that were tackled the whole place feels freshened up and fighting fit for the new volunteering year. It’s been a fantastic team effort by everyone involved and we’re really chuffed with the results – we’d literally never have done it without all the help from the volunteers. There was also an additional benefit in that the working holiday leader contingent used the Saturday night to have a get together and talk through various issues. So not only were we getting the place spruced up, we were providing a conference centre! But it was all a bit much for some!